FLORENCE, Ky. -- Thursday night was Mitch Shelley’s chance to shine. Shelley, an eighth-grader with autism, attended every practice of the Ockerman Middle School basketball team during the 2016-’17 school year. As the team’s manager, he ran drills, gave pep talks and kept track of equipment for his teammates. "He keeps morale up with the team," said Coach Wes Combs. For the team’s final game Thursday, Combs decided to do something special: He invited Shelley onto the court. "I got a real quick smile and a, ‘Sure, I can do that, coach,'" he said. Shelley donned a No. 43 jersey and played forward in the team’s last game of the season -- and the final game of his middle school career. He was a starter and scored the first points with a special play his team called "the Mitch and Roll." Mitch will attend Boone County High School next year, and who knows: You might see him continue his basketball career there. 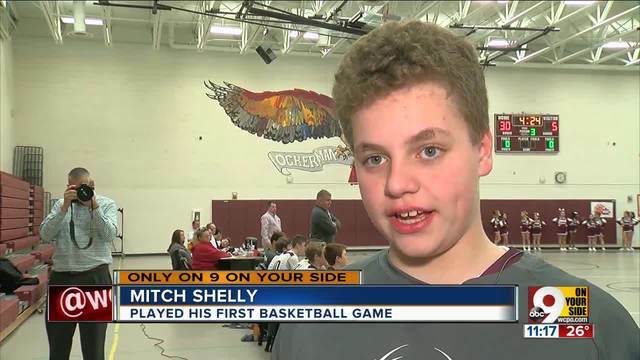 Watch the video above to hear from Mitch and his coach about his awesome game.